Status: offline 34 year old male Drill Sergeant complains of right medial knee pain for 3 months. No specific mechanism of injury. Pain starts around the posterior and medial portion of the knee at about the 2 mile mark during running. Swelling occurs after running. What are the findings on the radiographs? I would say something isnt right with his lateral view, in the prox tib fib joint, and the projection below it. Exostosis comes to mind. The superior tib fib articulation should not look like it has a weight bearing surface to it. I also question the oval shaped object in the MFC. But, thats all I can guess at for now, except for the medial tibial hole thingy, that looks like a previous location for an ACL screw, but is likely the exostosis noted on the lateral view, so never mind. Status: offline Looks like a tibial hole thingy. On the lateral view it appears to almost wrap around the fibula but on the AP view it is obviously medial. Is this an Myofascial ossification? I agree with Shill that the fibular head also looks a bit odd. Status: offline The tib-fib articulation does look a bit odd. The medial aspect, if it was an old ACL hole for a screw, may be the culprit. Can't really tell from the resolution on my screen. Since his symptoms are medial in nature, I do see some sharpening of the tibial spines which makes me think early degenerative changes, and I think I see a loose body or OCL/OCD (osteochondral lesion / osteochondritis dissicans) in the medial compartment near the tibia. Brief trial of PT will probably be ineffective if it is indeed a OCD/OCL medial compartment. He may also have hx or exam c/w MMT. Status: offline Pellegrini-Stieda Disease. Should resolve with time. Stop running two miles. I think Mickey nailed it because the subjective complaints fit and you can see Pelligrini's or Steida's shadow (I think that's what they call it). I wouldn't have agreed but I had a similiar patient a few weeks ago. Status: offline Nice. Have not heard of this before. Interesting to look up. None of the orthopedists I work with never mention this at all. It is most common in the first two decades but exceptions are the rule. It looks just like a pedunculated osteochondroma to me. But like anything else in radiology, that doesn't mean a hill of beans. Status: offline While OCD is usually found in younger patients, it can occur as late as the 30s, and there was no mention of past history beyond HPI, so this patient may have had previous trauma distantly which might have created the ?OCL at his medial tibia. I don't know what to think of the tib/fib and what looks like even posterior tibial dysplasia. I agree that osteochrondroma is likely. 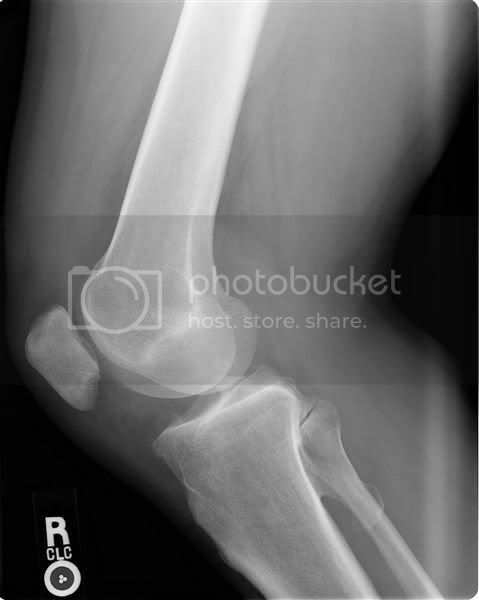 Mostly b/c anything I see on films of the knee that looks odd is usually an osteochondroma, just statistically speaking. Status: offline FINDINGS: There is a 4.0 x 2.3 cm bony excrescence off the posterior tibial metaphysis, demonstrating medullary continuity with the tibia. There is no fracture or dislocation. There are no significant degenerative changes. The tissues are unremarkable. IMPRESSION: Posterior tibial osteochondroma. Given that this is the site of pain, recommend further evaluation with MR. It is kind of weird, but the osteochondroma is in the shape of Italy. It also has an uncanny appearance of something else, but we won't go there. Status: offline Here is some information on osteochondromas. Osteochondroma is by far the most common of the benign tumors of the bone, comprising 9.3%% of all bone tumors in Dahlin's series. These are benign bone tumors characterized by cartilage capped bony growths that project from the surface of the affected bone. When the lesion is seen only in a single bone, it is called a solitary osteocartilaginous exostosis or osteochondroma. When the tumors are distributed over the skeleton and there is a familial history, they are then designated as multiple hereditary exostoses or osteochondroma. The individual lesions of solitary and multiple osteochondromas are basically identical radiographically and pathologically. The structure of the tumor consists of central core of bone marrow, which is identical to and continuous with the marrow of the underlying bone. This is enveloped by a cortex and periosteal covering, which are continuous with that of the affected bone. The tumor is capped by a layer of hyaline cartilage, which frequently extends well over the pedicle and sometimes approaches the normal cortex. The exostosis is produced by a progressive enchondral ossification of this growing cartilaginous cap. The cartilaginous portion of the osteochondroma acts as an enchondral plate for this abnormal growth and persists as long as there is growth activity. The growth usually stops when the nearest epiphysis has closed. The great majority of these tumors then becomes inactive during the adult life. Subsequently the cartilaginous cap tends to involve, but remnants usually persists. A solitary osteochondroma usually arises in the areas where cartilage is ordinarily found. Although the lesions are not infrequently seen in the pelvis, most are seen in the metaphyseal regions of the long bones. About 1/3 are located in the distal femur and another 1/3 equally divided between proximal humerus and proximal tibia. About 7%% are seen in the ileum. In multiple hereditary osteochondroma, the lesions number from a few to a thousand with an average of 10 per patient. They are most frequently located in the metaphyseal portion of the long bones, particularly in the knee, ankle, shoulder and wrist. The tumor usually comes to attention in childhood or adolescence, the greater majority in the second decade of life. The patient usually notices firm swelling not associated with any symptoms. If the tumor becomes large and bulky or located near nerves and blood vessels, it may cause discomfort by compression of the surrounding structures. Uncommonly, a fracture through the stalk can cause severe pain and hematomas. More uncommonly there have been reported cases of cauda equina syndrome from bulky osteochondroma of the lumbar spine and cases of traumatic aneurysm of popliteal arteries from sharply pointed osteochondroma. Status: offline Hats off to Greg! Nice job! Thanks for the interesting review Alex. Status: offline Thanks for the update guys. Definitely one to remember. Keep them coming Alex. Status: offline I know I missed it entirely! Of the osteochondromas I've seen on films, they're quite large and very defined. This one was elusive for me and I imagine quite a few others. 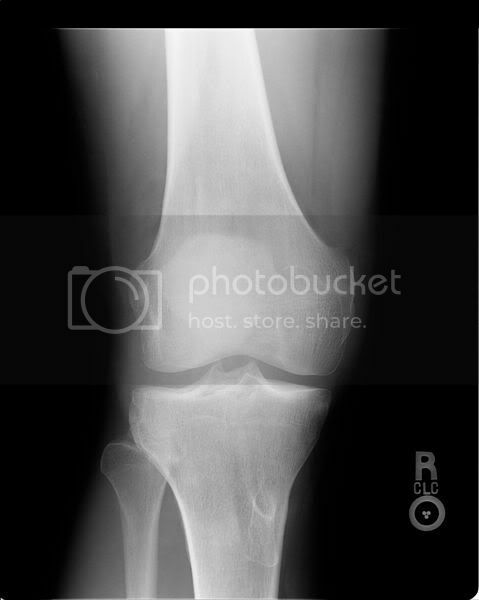 I just evaluated a patient yesterday s/p right knee osteochondroma excision. If I had a way to post his pre-op films I would...man was that thing HUGE!! !